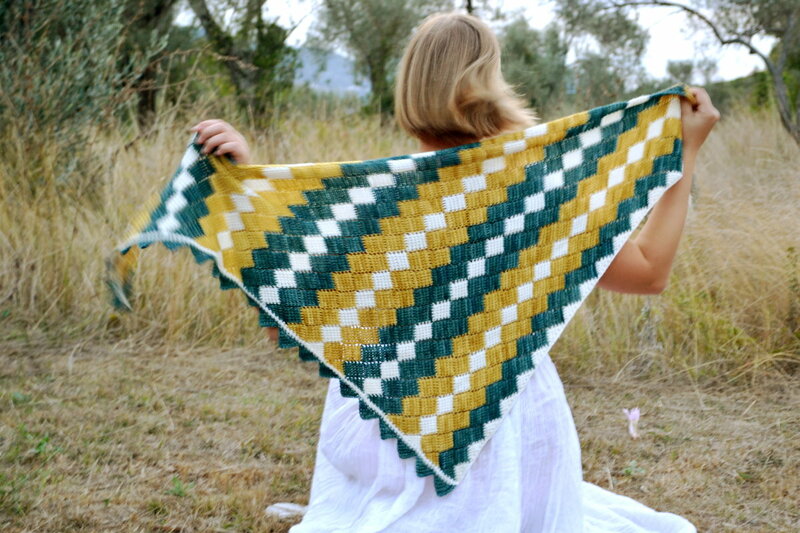 Yesterday I published Cabo Verde, the second pattern of my Mental Vacation collection. 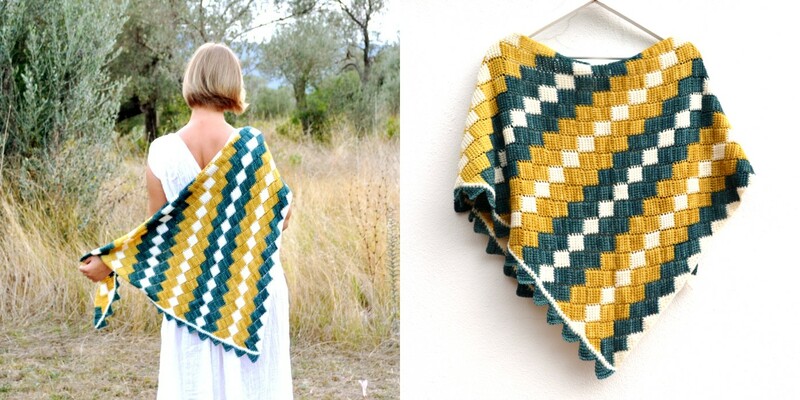 This eye-catching wrap is worked in Tunisian crochet entrelac, a simple and relaxing technique. It does not require any special Tunisian hook, because you don't work with more than 7 stitches at a time, and you can place all of them on your regular crochet hook. 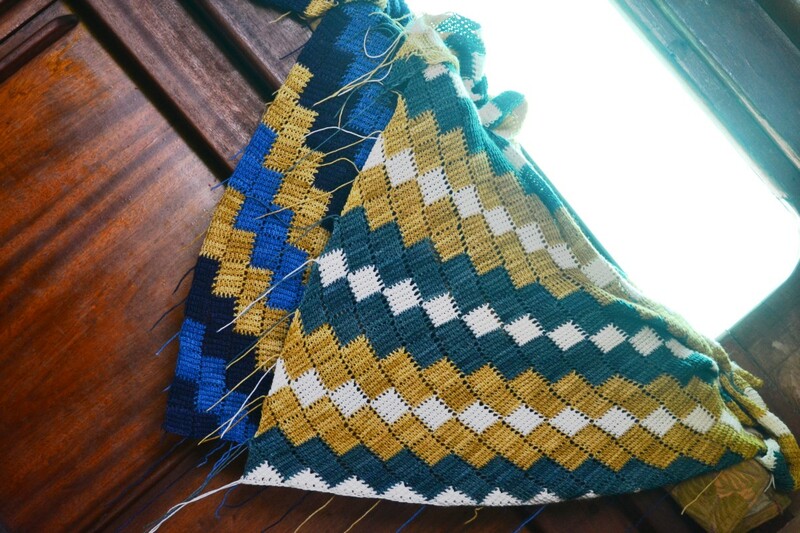 It is as enjoyable to make as The Nile, particularly since the rows become shorter and shorter towards the end (I think almost everyone loses some of their enthusiasm once the project crosses the equator, but not with this shawl! You don't get a chance to become bored!). The construction of Cabo Verde is different from The Nile. The Nile starts from the top and is worked in horizontal rows down to the bottom edge. This shawl is worked sideways starting from a corner with a base row of triangles along one side of the shawl, which results in diagonal stripes. I've finished both shawls almost at the same time. But if The Nile looked and felt perfectly complete, there was something missing in Cabo Verde. It took me almost a month to realize that it needed an edging at the end of the zigzag stripes. I tried numerous edge variations: a wide white stripe, ruffles, etc, and almost gave up when I had this simple idea. An ideal edging should continue from the main shawl body, be a part of it, and I need to use the entrelac elements to create the perfect harmony. A saw-tooth edging looked like the best option possible and it was worth searching for! 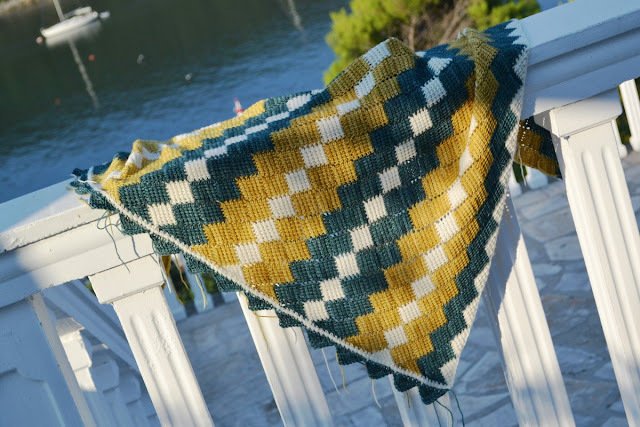 The pattern assumes basic familiarity with Tunisian crochet, specifically how each row is worked as two separate passes and how to work the Tunisian simple stitch (you can find a Tunisian crochet glossary here). The level of complexity is a little bit higher than that of The Nile: the pattern uses partial squares (worked in half) for the straight edging along one side, a narrow border (using the border stitches of the body of the shawl) and the saw-tooth triangles for the edging. Nothing too complicated, but just a bit different from The Nile, to give you something new to play with. Lena - this is stunning! Love the color combination and the pattern is spectacular! Thank you so much, Maya! I absolutely love everything about this shawl! the colors - design - gorgeous! Hi! I love your shawl! I wanted to let you know that I'll be featuring you at my weekly link party on my blog. I hope you will join the party again. Have a lovely day!